PaperCut MF provides integration with Dell MFDs, to enable the tracking, charging or billing of network printing and "off the glass" copying, faxing and scanning. Tracking of all copies, prints, scans and faxes. End user authentication, including integration with single sign-on to industry leading environments. Group-based access and control to all supported MFDs / multi-function printers. Charging and accounting by quotas, debit accounts and shared accounts which may represent a department, company, matter, project or other user group or cost center. Secure Print release of confidential materials. 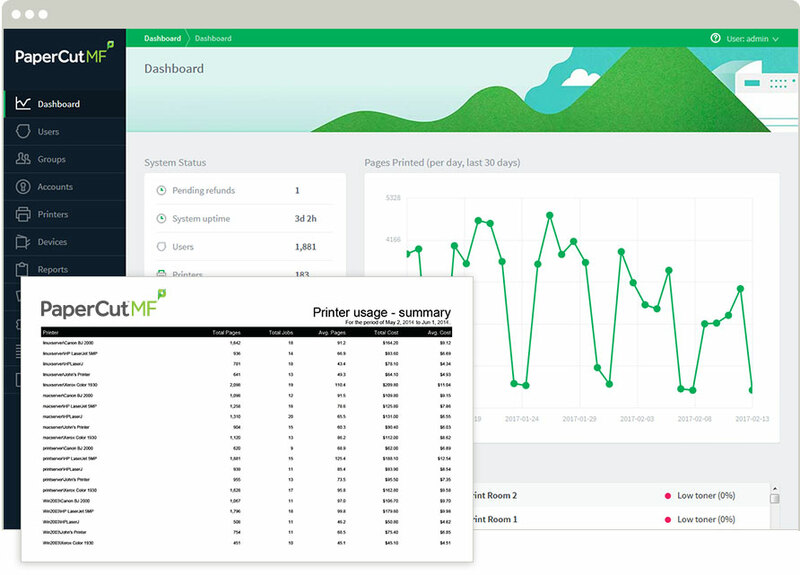 Support for "find me" printing, utilizing PaperCut MF's core web print, mobile print and mobile print release features. PaperCut MF provides centralized management of all users, copiers and printers via a simple web based Administration console, where all copying and network printing can be managed together from a centrally adminstered location. Display instructions and your organization's own custom logo on the login screen. Protect and limit access to your valuable Dell MFDs from unauthorized staff and visitors or restrict functions e.g. color copying to selected members of your organization. Group memberships in your user directory can serve as a basis for access control. PaperCut MF tracks copying page-by-page and reports usage for up to the minute reporting. Page and job attributes including color/grayscale, page sizes, duplex logged by user, device and date/time are standard features. a pay per use policy, where funds are debited based on pages printed or job cost. Each job may be allocated to a shared account that can represent a department, project, client / matter or cost center. Administrators can configure each user's interface and account availability depending on their role. Access to shared accounts is easily administered and can leverage Active Directory/LDAP groups. PaperCut offers secure print release as a core feature. The Dell MFDs with PaperCut MF embedded provides print release directly from the touch screen. This feature ensures that only the owner is able to securely release and retrieve their job at the MFD. "Find Me" printing is also known as "Pull Printing". This feature provides users with the ability to press "print" and then retrieve their job at any supported printer on the network. More on Find Me printing in our PaperCut NG tour. The Dell embedded solution is developed in-house by the PaperCut Software development team. This ensures consistency in all areas of the application. All embedded solutions communicate with the local PaperCut server whether it be running on Windows, Windows Cluster, Linux, Novell or Mac Server. Today, security is a paramount consideration for organizations of all sizes. PaperCut was initially developed in education catering for both students and staff, where access and security is a high priority. Where security objectives can't be satisfied, any deficiencies are fully disclosed. Disclaimer: Dell is a Trademark of Dell USA. PaperCut is solely responsible for the contents of this publication and the performance of PaperCut's products.